Barclays Bank has sold most of its Monument sub-prime credit card unit in an effort to cut its bad debts. US-based Compucredit bought the Monument business for £390m ($769m), about £100m less than its book value. Barclays said it had held onto "higher quality accounts" from the Monument portfolio, worth about £130m. The sale comes days after US lender New Century, which provides mortgages to people with poor credit histories, filed for Chapter 11 bankruptcy. New Century said it had been forced to take the measure, which will give it protection from legal action by creditors and breathing space to restructure its finances, in the face of rising mortgage defaults. 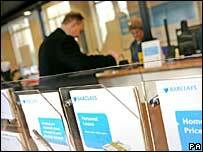 Sussex-based Monument, which is part of Barclaycard, is the worst performing unit at the bank. Barclaycard has 16.2 million customers worldwide, 6.4 million in the UK, and its bad debts jumped by more than a third to £1.5bn last year as customers struggled to pay back loans. Overall bad debt at the bank rose 37% to £2.15bn in 2006. News of the Monument sale comes days after Barclays announced it was buying US sub-prime lender EquiFirst for $76m - substantially less than the $225mit first offered for the group. Barclays, which is in merger talks with Dutch bank ABN Amro, said the lower price reflected growing problems in the US housing and sub-prime markets.